We woke up in Larned and got everything packed away pretty quickly. We ran in to the local grocery store, Dillons, and bought some drinks to carry with us throughout the day. While at the store, a lady had set off her car alarm and we spent a few minutes with her to try and help her figure it out. We managed to get the alarm to go off, after getting weird looks from store employees, plus waking up the entire town. 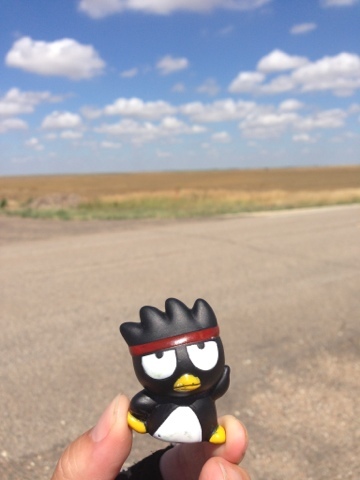 We passed the Ft. Larned National Historic Site, about 6 miles out of town. Then, my friends, we found the wall of cross-winds blowing our way at 20-30 miles an hour. It was brutal, along with the kickback of wind we got every time a semi truck passed by. Thankfully, we were able to turn north so the wind was at our backs for about 20 miles. We really enjoyed this part of the day, as we rode up a few hills with little effort at surprising speeds. As we neared the town of Rush Center, we even enjoyed a couple of miles downhill. We stopped at Rush Center for lunch at the only place in town that had food...Greg's Pub and Grub. We didn't realize it until we stopped, but the heat was getting pretty bad. Earlier in the day, we met another cyclist from Savanna, GA doing the trail and swapped stories about making it through the Ozarks. He was just leaving Greg's as we were pulling in, but highly recommended the cheeseburgers. After a filling lunch, we set our sights and bikes for Ness City, a mere 31 miles away. We knew we might have a difficult time, as the winds were still blowing full force and we now were riding slightly head on into them. Riding into the wind is probably the thing I hate most about riding bikes because it turns something relatively easy into a challenge, and there is nothing you can do but keep going. At one point, Erica pulled into an old grain elevator to find water and as I pulled up behind her, facing north, the wind literally pushed me over the small hill onto the road to meet Erica. 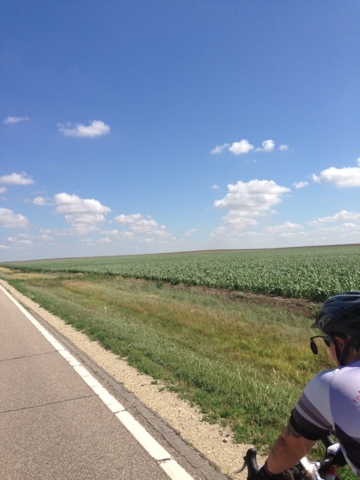 Riding in Kansas had been awesome up until this point and as the miles wore on, we were struggling with the wind and just not being able to see anything but fields for miles and miles. It's hard to describe the mind trick this becomes, but suffice it to say that we were convinced that Ness City didn't exist, because we were in the middle on nowhere. Finally, we reached a roadside rest area, bought some cold drinks and refilled our water and dreaded the last 18 miles to town. I literally watched the odometer and was counting down, which is usually my last resort to keep our spirits up. When we did roll into Ness City, we decided that we desperately needed showers and a bed to sleep in, so we stopped at the Oil Derrick Inn. Right about this time, everything else in town was closing up shop, except for one gas station and convenience store on the other end of town, so we hiked down the way and bought 5 different drinks and food we could heat up in our room. It was the end of a rough day for us, and we were glad to let the sun set on a difficult journey.